Welcome to City One Tourism & Travel L.L.C. Welcome to City One Tourism & Travel L.L.C., a local destination management company for Dubai. We Offer comprehensive travel programs to corporate and individual travelers with variety of custom designed holidays and business travel with a great level of attention. We specialize in handling. The journey will begin in the evening where you get to explore Dubai's warm hospitality and rich cultural heritage. With intriguing deserts, beautiful beaches, luxurious hotels and shopping malls, fascinating heritage attractions and a thriving business community. The endless desert is the best fun when you get to ride over the golden sands with your very own desert safari Dubai expert. Don’t miss taking selfies with the endless desert in the background as you make your way to the camp. The team at City One is simply superb. They are highly motivated individuals performing at high energy levels - of course deriving it from the GM himself. Their work isn't just professional, quick and elaborate but ends up leaving a mark on us and on our guests whenever we use their service. After using the services of many tour operators in Dubai, getting introduces to City One is just what we needed. We highly recommend City One. 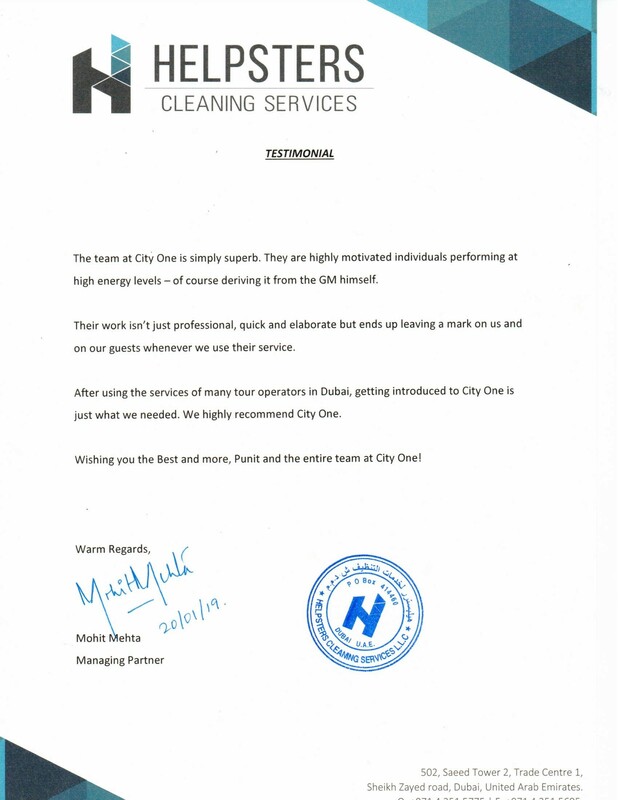 Wishing you the Best and more, Punit and the entire team at City One! City One made our life easy by providing fast and economical solutions to our client's visa requirements. Whether it is new visa or extension they do it so professionally. Whether it is desert safari or Abu Dhabi trip they are best in price and best in service. I will always recommend City One for all your travel needs. 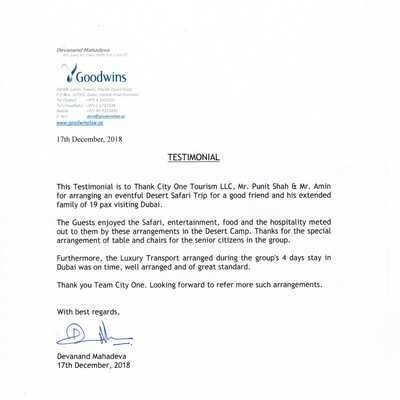 This Testimonial is to Thank City One TourismLLC, Mr. Punit Shah & Mr. Amin for arranging an eventful Desert Safari Trip for a good friend and his extended family of 19 pax visiting Dubai. The Guests enjoyed the Safari, entertainment, food and the hospitality meted out to them by these arrangements in the Desert Camp. Thanks for the special arrangement of table and chairs for the senior citizens in the group. Furthermore, the Luxury Transport arranged during the group's 4 days stay in Dubai was on time, well arranged and of great standard. Thank you Team City One. Looking forward to refer more such arrangements. Creative and diligent approach to search for the most appropriate travel packages & arrangements & identifying the best possible value for money.